I remember the first time I saw Jerry Pournelle. I’d read his books. Along with Larry Niven, Jerry Pournelle was famous in the science fiction community. So when he was going to speak at my university, UCSD, I invited my friends to attend. As we were killing time before the talk, we walked around the campus. I bemoaned how there were so many nerds on campus. To illustrate the point, I referenced three people walking toward us. It was only then that I recognized two of them as Larry Niven and Jerry Pournelle. The third was Pournelle’s son, Alex, who was attending UCSD. Mr. Pournelle passed away this last week. His influence on both science fiction as well as the computer industry is profound. And he was quite the character. I’d seen Pournelle speak at quite a few science fiction conventions in southern California. He was always loud and opinionated. “We should deliver foreign aid by ICBM,” he once said. During one of his panels, I asked about alien invasion. He burst out laughing. “It would never happen!” he explained. Little did anyone in the room know that at the time he and Larry Niven were working on Footfall, perhaps one of the best (and creepiest) alien invasion stories ever. Pretty much everyone at UCSD knew that Alex Pournelle was attending. He was computer science major, if I recall. I remember one of my friends telling an anecdote about Alex: Apparently he was in some computer or engineering class and he performed poorly on a test. Then the professor added, “Alex, you aren’t even registered in this class.” I don’t know if it’s true or not, but the tale made the rounds. As I got into computers, I discovered BYTE magazine, which was the grandaddy of all computer magazines. Before the Web, that’s how you learned information. As a typical nerd, I subscribed to dozens of magazines a month, devouring them to gain more knowledge and insight about computers and the industry. Pournelle’s column in BYTE was called Chaos Manor. The title required no explanation. Each month, he would spend three or four thousand words describing his adventures with various computers, hardware, and software. Developers and manufacturers would send him stuff daily. He’d test things and offer his opinions. It was a marvelous read, especially if you knew Pournelle and could imagine him speaking in his loud, Texas drawl. During my time on BIX, I received an drunk email from Pournelle. I wish I’d kept that email . . . I met Pournelle a few times, once at the West Coast Computer Faire and a few times at Comdex. I also met his charming wife, Roberta. To my surprise, they both knew who I was. We had some delightful conversations. 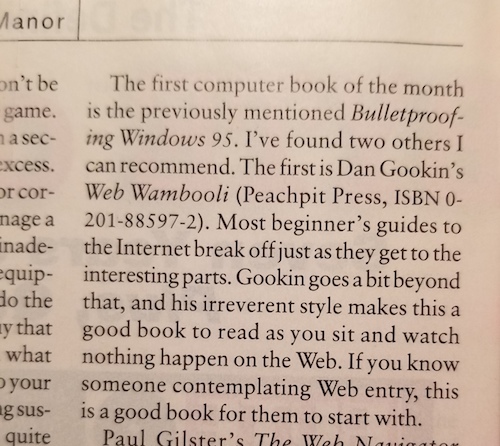 In the August 1997 issue of BYTE, shown in Figure 1, Pournelle reviewed and recommended my book Web Wambooli. Figure 1. 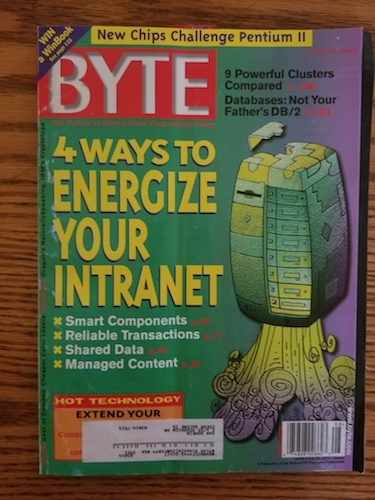 The August 1997 issue of BYTE magazine. The review, just a paragraph at the end of his column, is shown in Figure 2. Figure 2. Jerry Pournelle’s brief and welcome opinion of my book, Web Wambooli. That may seem insignificant in the course of the great things Pournelle has done, but it meant enough to me that I’ve kept that issue of BYTE all these years. Jerry Pournelle, you will be missed.